Time management apps help you take care of the one thing you really can’t make more of. These three apps do a great job of maximizing your time and making sure you get paid for it, plus they provide helpful analysis and organization tools. 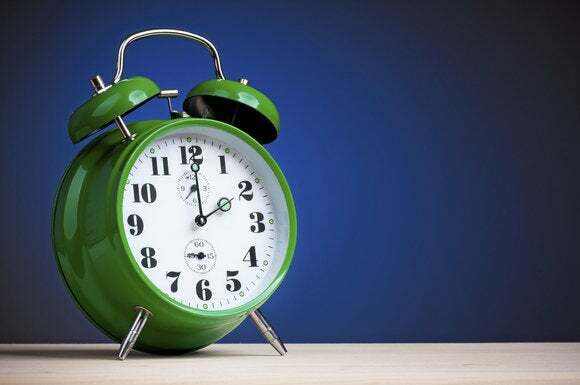 Timeful offers suggestions on how to fit in those good habits we all need to make time for. I’m wary of technology products that claim to be able to make decisions for you. That’s why I wasn’t so sure about Timeful, an iOS app that strives to help you make the most of your time. It does that by combining your calendar, to-do list, and your “daily habits” in one central location, and offering suggestions on how you can best use your time. 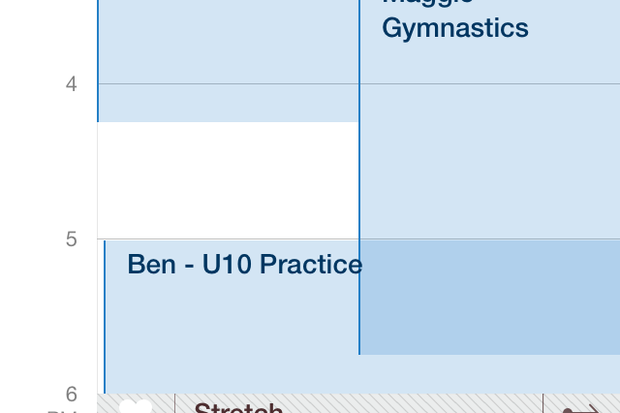 I’m still not sure I want to leave an app in charge of determining my schedule, but Timeful is winning me over. 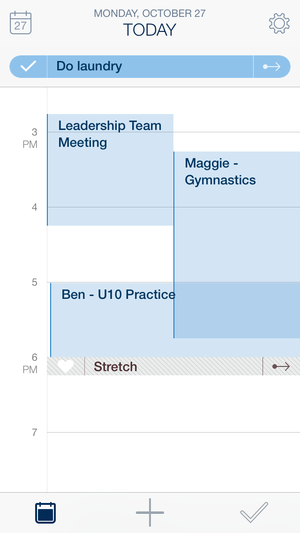 Timeful integrates with your existing calendar, displaying all of your appointments and entries in a neatly designed layout that’s easy to view, even on a small screen. It also lets you create a to-do list, offering a few suggestions on tasks that range from helpful (call mom) to less practical (take a hot air balloon ride). Luckily, adding your own to-dos is a breeze if you don’t like Timeful’s suggestions. It also includes a list of good habits you might want to make time for, such as exercising, drinking water, and calling a friend. Again, you can add your own easily enough, and you can tell the app how often you’d like to do each of these items, and what time of day you prefer. Once Timeful knows what you want to do, it helps you find time to do it. The items are displayed at the top of your daily calendar, and Timeful makes good use of the iOS touch screen, allowing you to drag them into an open spot or shuffle them off until the next day. The more you use Timeful, the more useful it’s supposed to get, as it learns your schedule and suggests times for your tasks. This may be true, but I’m too much of a control freak to hand over complete control to an app. Still, I like how Timeful integrates all aspects of my life into one handy app, making it a little easier for me to stay on top of all I have to do. Freckle’s main dashboard displays a quick version of its Pulse feature, which allows you to see how you’ve been spending your time at a glance. It’s no secret that tracking your time is annoyingly time-consuming. But it’s a whole lot easier when you use Freckle. This Web service and mobile app (Android and iOS) includes a timer that does the counting for you, as well as tools for logging additional time, invoicing, and analyzing how your time was spent. If I’m going to rely on a time-tracking service, it needs to be drop-dead simple, with almost no learning curve. Freckle comes pretty darn close. The service offers a two-minute overview that got me up and running quickly. I like how easy it is to create projects and track time spent on them, and I really like how Freckle uses tags, so you can spot trends in your work and analyze it later on. Once your time has been logged, Freckle proves its worth. Its “Pulse” view displays an overview of your month, so you can see where your time was spent at a quick glance. 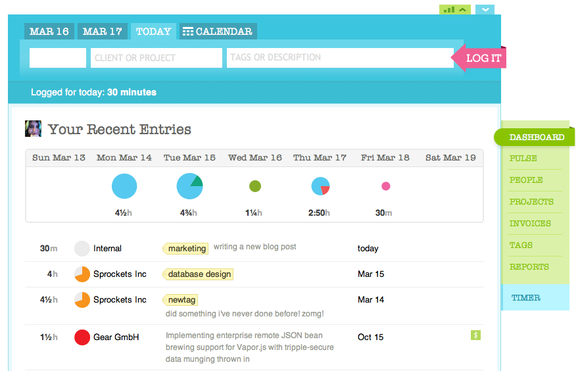 For more detailed information, Freckle offers Reports, which you can customize by time period, client, project, and the tags you’ve used when logging your time. The Reports screen can be a bit overwhelming at first, but that’s in large part because Freckle offers so many on-screen tips about how to use all of its features. Taking a few minutes to read through them proved very helpful. Freckle includes invoicing tools that are simple to use, and allow you to create slick-looking invoices quickly. It’s an easy way to make sure you’re getting paid, but you’ll also have to pay up to use Freckle. The service includes a 30-day free trial, but after that, plans range from $19 per month (1 user, designed for Consultants and Freelancers) to $159 per month for large teams. Chrometa's interface isn't flashy, but it offers an easy way to see exactly what you've been working on. I was worried Chrometa’s records of my activities would be too general to be helpful, that was not the case. Chrometa was able to tell me I was working in Microsoft Word, and also the exact name of the document I was editing or the subject line of the email I was typing. Once your activities have been logged by Chrometa, you can assign them to certain clients or projects. This is the most tedious part of using Chrometa, but it’s not difficult. Chrometa can create timesheets automatically, and allows you to track time spent away from the computer, which will prove useful to lawyers and other professionals. Chrometa includes a free 30-day trial, after which pricing starts at $12 per month and goes up from there. That’s a small price to pay for an application that’s so good at tracking your time, it’s almost spooky.